Search giant Google this week launched a new service for Internet users and researchers, designed to detect moves by Internet service providers (ISPs) to filter or throttle their subscribers’ Internet connections. The Measurement Lab (MLab) is described as an early warning system which can flag possible Net neutrality offenders for closer attention by free speech and civil rights advocates. Google wants to encourage partnerships with independent Internet researchers to build and deploy a wide variety of Internet research and measurement tools. But individual Internet users can test their own connections now, for free, to see if they’re getting what their ISP promised. Test your connection speed and receive sophisticated diagnosis of problems limiting speed. Test whether BitTorrent is being blocked or throttled. Diagnose common problems that impact last-mile broadband networks. Determine whether an ISP is degrading the performance of a certain subset of users, applications or destinations. Determine whether an ISP is giving some traffic a lower priority than other traffic. The Measurement Lab will eventually employ a dozen Google servers around the world. However, there are currently only three dedicated MLab servers in place and they were very busy when we attempted to try out the various testers. Wait times of about 15 minutes were the norm. Fortunately, there are other servers available, running the same diagnostic tools, and they are listed along with the MLab servers at the MLab Web site. Unfortunately, even the alternate servers were extremely busy several days after the MLab launch. This past Wednesday was international Data Privacy Day, with privacy and civil rights groups as well as corporations in The U.S., Canada and more than two dozen European nations holding special events and releasing statements in honour of the occasion. Their comments and suggestions were largely targeted on the Obama administration, which — initially, at least — has taken a positive, proactive stance on Internet issues. The Identity Theft Newsletter featured opinion pieces by three noted privacy experts, who pointed out a number of actions that governments could take to combat the growing threat from online identity theft. The Electronic Frontier Foundation (EFF) pointed out that the Whitehouse.gov Web site, itself, places intrusive ‘cookies’ on visitors’ computers when they view YouTube video clips embedded on the site. The EFF says the Obama Web team should set a good example and work with YouTube to eliminate cookies from the Whitehouse.gov process. Microsoft (MS) hosted a special Data Privacy Day panel with representatives from MySpace, Intel, the California Office of Privacy Protection, Teenangels and the Center for Democracy and Technology. The panel will considered the results from two MS-sponsored focus groups in which consumers revealed their concerns about online privacy. MS Chief Privacy Strategist Peter Cullen told CNet.com earlier this week noted that focus group participants seemed resigned to face the threat of privacy breaches and identity theft indefinitely. But he characterized that finding as a wake-up call to the industry. Independent security researchers have disclosed a vulnerability in current versions of the Google Chrome Web browser (versions 1.0.154.43 and earlier) and Mozilla’s popular Firefox (version 3.05) which could allow cyber crooks to ‘clickjack’ unwitting surfers. Clickjacking, in essence, redirects clicks a visitor makes on one Web site (usually a legitimate one that has been hacked and had malicious code inserted without the page owner’s knowledge) and redirects them to another, malicious site. “Attackers can trick users into performing actions which the users never intended to do and there is no way of tracking such actions later,” researcher Aditya K. Sood said in his official disclosure of the Chrome/Firefox flaw. Late yesterday, Google reps confirmed that they are working on a Chrome fix for the clickjacking flaw and noted that Google was unaware at that time of any actual attacks ‘in the wild’ exploiting the vulnerability. No word, as yet, from Mozilla on a Firefox fix. However, Firefox users should be advised automatically by Mozilla when an update is available. Internet security leader McAfee Inc. has released what it describes as, “a wake-up call for businesses and governments worldwide,” highlighting the vulnerability of much of the world’s intellectual property and sensitive information. Overall, the study reveals that cyber crime could currently be costing businesses worldwide more than (US)$ 1 trillion annually. The global estimate is based on reports of approximately (US)$4.6 billion in actual intellectual property losses plus another (US)$600 million in ‘firefighting’ and repair costs from 800 corporate Chief Information Officers (CFOs) polled by McAfee in the U.S., UK, Germany, Japan, China, India, Brazil and Dubai. In addition, industry observers are quick to point out that corporate executives may be prone to underestimate losses — or deny them altogether — in response to potentially embarrassing survey questions. The recession puts intellectual property at much greater risk (as the pressure to compete more effectively increases). Corporate commitments to protect vital information vary greatly. Intellectual property is now a freely-traded international black-market currency, traded similarly to the way consumer credit card information has been traded for some time, now. Financially-strapped and disgruntled employees are increasingly stealing intellectual property for personal financial gain and competitive advantage in the tight job market. The full survey report will be available later today at the McAfee online Press Center. Note: It’s in MS PowerPoint format, so you’ll need PowerPoint or a PowerPoint-compatible reader to view it. Update: The U.S. House of Representatives has killed a proposal from the U.S. Senate to delay the switch from analogue to digital TV broadcasting there. The Senate measure called for a four month postponement in the switchover date, from February 17 to June 12 of this year, to allow Americans not yet prepared for the change to take appropriate measures. Estimates of the number of U.S. households which currently rely on direct broadcast TV rather than satellite or cable range from 6.5 million to 20 million. Oponents of th delay said it was unfair to TV broadcasters which would have to continue transmitting both digital and analogue signals until the summer, and would cause confusion for consumers. The U.S. government has been offering grants of $40 per household since late last year to offset the cost of digital set-top converter boxes so people with older analogue sites can receive the new digital signals. However, the National Telecommunications and Information Administration, which is responsible for the grant program, has already dispensed the entire (US)$1.3 billion allotted for the program and is awaiting delivery of anoither (US)650 million approved earlier this week as part of the Obama economic stimulous package. As counter-intuitive as it may sound, Google — and legions of mobile mail users — are excited about a new feature being tested by GMail Labs: offline e-mail. Offline GMail doesn’t let you send or receive mail when you can’t get an Internet connection, of course. But it does let you work with downloaded mail until you can connect again. This is seen as a boon to mobile users who often experience intermittent wireless service — or none at all — while traveling by plane, train or other modes of public transportation. When you enable Offline, GMail creates a local (on your computer or mobile device) cache of your e-mail messages. You can read messages, compose replies and perform searches in your cache. You just can’t send messages or check for new ones. When you do establish an Internet connection again, GMail sends any replies or new messages you have composed while offline and updates your cache with any new messages that are waiting on its server. To try Offline GMail, just follow the instructions at the end of the announcement. The European Commission (EC) met earlier this week to discuss troubling findings in a report released last October, warning of a possible hearing loss epidemic due to listening to portable music players at high sound levels. The study, by the EC’s Scientific Committee on Emerging and Newly Identified Health Risks, titled “Potential health risks of exposure to noise from personal music players and mobile phones including a music playing function”, focuses on the effects of ‘social noise’ exposure. Before getting into the specific causes and effects of social noise exposure, the study notes that social noise exposure to young people in the EC has tripled in the past two decades while on-the-job noise exposure has decreased, suggesting that social noise should be accorded a higher priority by legislators and regulators. The survey estimates that 5 to 10 percent of all portable music player users in the EC are at risk for hearing loss due to the levels, patterns and durations at which they listen. That translates to an estimated 2.5 to 10 million users across the EC who have listened at high volume levels for more than an hour each day over a period of five years or more. The study also notes that many users who like their music loud play it at levels above 89 decibels, exceeding the level which is currently allowed for workplace noise. The EC meeting this week looked at several options to address the hearing loss situation, including technical solutions and changes in existing regulations. France has already established regulations limiting the maximum volume at which music players sold there can be played. In response, Apple has installed a volume limiter on its iPod players sold there. After 11 days of online visitor voting and more than 300,000 ballots cast, CNBC.com has declared a winner in its competition to determine the most popular ‘As Seen On TV’ product of all time. Starting with a field of 64 products advertised in pitch-man style TV commercials, divided into four tech categories, CNBC gradually closed in on a champion via a tournament playdown grid. The George Forman Grill and the ShamWow super towel faced off against each other in the final, climactic showdown. 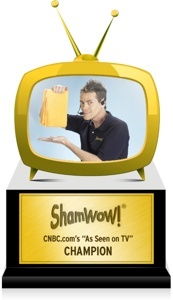 And ShamWow emerged the victor. A curious footnote to the CNBC ‘As Seen On TV’ tech showdown: It seems that the company behind ShamWow isolates itself pretty effectively from outside contact. CNBC reps reported being unable to find a phone number (other than the one at which operators seem perpetually to be standing by to take orders) and they received no response to e-mails to the only contact address listed on the company Web site. Which put CNBC in the odd position of having an award which they could not present and a winner they could not interview. Following the lead of some other countries where camera phones are even more popular than they are in North America, the U.S. Congress is considering a bill which would make it mandatory for all phone cams to make a clearly audible clicking sound when capturing an image. It’s a measure designed to ensure that people know when their picture is being taken. And, though it appears to be a privacy concern, the bill in question is characterizing it as a “product safety” issue. Because the audible tone is already a requirement in jurisdictions such as Japan and Korea, many phones already have the capability built in. However, some current models apparently allow users to disable all sound cues The ability to disable the sound would, itself, have to be disabled on models sold in the U.S. if the CPPAA is passed. Nevertheless… Reports indicate that, for phones which don’t allow sounds to be disabled, hacks have already been posted on the Net to modify their frimware enabling disabling. A New Zealand man who bought a second-hand MP3 player in a thrift shop while visiting Oklahoma got more than he bargained for. It seems the player’s onboard memory contained personal information on U.S. military personal including names, telephone numbers, Social Security numbers, notes from mission briefings in Afghanistan and even information on pregnant U.S. military personnel. “The more I look at it, the more I see and the less I think I should be looking,” he told TV New Zealand, describing his discovery of the files. Peter Cozens, the Director of the NZ Centre for Strategic Studies, opined as the “leak” would not seriously effect U.S. national security. The information is apparently dates from 2005. Similar incidents in the recent past involving thumb drives and other USB devices resulted in a total ban on removable media drives in U.S. military installations. No comment from the U.S. embassy in New Zealand. So begins the overview of the results of a new NASA funded study of the effects of so-called super solar flares. The report, officially titled Severe Space Weather Events – Understanding Societal and Economic Impacts, provides 132 pages of detailed analysis and speculation about the effects of major flares and their accompanying magnetic storms on our modern technical infrastructure. [The grid] is particularly vulnerable to bad space weather. Ground currents induced during geomagnetic storms can actually melt the copper windings of transformers at the heart of many power distribution systems. Sprawling power lines act like antennas, picking up the currents and spreading the problem over a wide area. The strongest geomagnetic storm on record is the Carrington Event of August-September 1859, named after British astronomer Richard Carrington who witnessed the instigating solar flare with his unaided eye while he was projecting an image of the sun on a white screen. Geomagnetic activity triggered by the explosion electrified telegraph lines, shocking technicians and setting their telegraph papers on fire; Northern Lights spread as far south as Cuba and Hawaii; auroras over the Rocky Mountains were so bright, the glow woke campers who began preparing breakfast because they thought it was morning. According to the report, power grids may be more vulnerable than ever. The problem is interconnectedness. In recent years, utilities have joined grids together to allow long-distance transmission of low-cost power to areas of sudden demand. On a hot summer day in California, for instance, people in Los Angeles might be running their air conditioners on power routed from Oregon. It makes economic sense but not necessarily geomagnetic sense. Interconnectedness makes the system susceptible to wide-ranging cascade failures. Thus, a serious failure involving transformers in one area could effect the power supply over a much wider area. All aspects of the essential services on which we rely in our daily lives — but too often take for granted — could fail, some within hours others within just a few days. The report essentially asks: Are we prepared to withstand, or at least deal with, the effects of a super flare? The overview, which includes links to the full report and related resources, is available at the NASA Web site. The U.S. Senate this week approved a four-month delay in the official switchover from analog to digital TV broadcasting. The deadline for broadcasters to cease transmitting using the old technology has been extended to June 12, 2009. Recent surveys revealed that better than 90 per cent of American TV viewers were ready for the switch but some still weren’t and, presumably, wouldn’t be in time for the original February deadline. Estimates of how many U.S. households still are not prepared for the switch to digital broadcasting range from 6.5 million to 20 million. The postponement throws plans by broadcasters into a bit of a tizzy, requiring them to keep their old transmitters running four months longer than they had originally planned. Other wireless players are waiting to launch new services in the broadcast space being freed up by the silencing of analog TV signals. The U.S. Government, too, is waiting to access a big chunk of the vacated broadcast spectrum for use by the military and other official services.